Price is some compensation that is exchanged by two parties. In internal business, it's all about the price. Aside from price being a factor of purchase, there are several other functions it serves. Determining profits, sales, market share, and store traffic are a few. It creates a perception of quality or exclusiveness. It can encourage trials, and discourage competition. There are several pricing strategies that should be considered when pricing products. These will be given in a list form because there are so many. Cost-Plus Pricing: The cost of a product + a percent markup. This strategy ignores many environmental factors, but guarantees profits if sales are made. Price Skimming: The price is initially set high to gain extra profits from early adopters, but set lower as more competition enters. This can work, but invites competition. Penetration Pricing: The start cost is lower to help enter the market. Most profits are made by not raising the price, but by cutting costs. Prestige Pricing: Creating a perception in the consumer's mind that quality is high, and they must pay a higher price for the product. Bait and Hook: The initial price of the main product is low, but replacement parts and other materials or services consumed in the process have higher prices. This works unless a competitor can create low priced replacement parts and materials. Price Promotions: This can be used to introduce new products or prevent consumers from defecting. It is also effective in selling older products when newer ones are available. Too many price promotions can cause consumers to wait and only purchase when there is a promotion, or switch between brands, cycling through promotions. According to Robert Dolan's true economic value (TEV) theory, consumers are only willing to pay the cost of the best alternative + the value of the performance difference. This can be useful in setting an initial price for a product based on what consumers are currently buying. When setting initial prices, it is important to be clear on what market segment is being targeted. Companies must revisit pricing strategies often and make sure they correspond to where the product is in the product life-cycle. 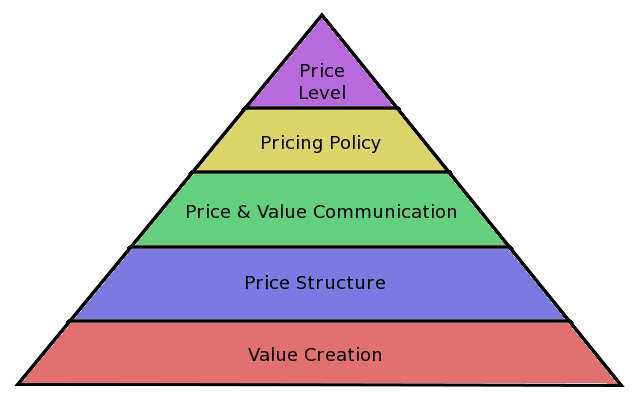 The Strategic Pricing Group created a pyramid that can be used as a framework to not only set a price for a product, but to have resources and a company capable of backing that price up. 1 - Value Creation: A product must be created and priced so a customer will pay for it, not simply be satisfied by it. 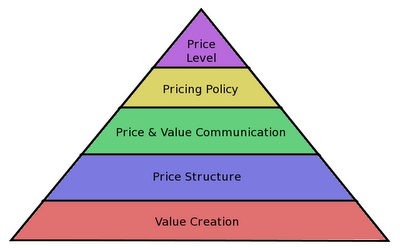 2 - Price Structure: Pricing should be based on the value received instead of the product delivered. Price for a customer segment rather than a product. 3 - Price and Value Communication: When value is not communicated, the doors to price sensitivity and price negotiations open. This becomes problematic. Having a communications strategy that uses both performance facts as well as psychological benefits will help solidify a value to a consumer. 4 - Pricing Policy: A stance must be taken on the frequency of discounts and promotions given. If this is not done, the customer base will drive profits down faster than the general efficient market. 5 - Price Level: Actual prices must be set and periodically reviewed in the same way throughout the company. This can take the form of a planned decision model that uses relevant data about how the market will respond to changes. Many times the best model is simply a fixed price/variable offering one. These 5 steps should be consistently known throughout the organization. What has been stated up until now has largely been academic in nature. It is now necessary to turn attention to a customer's view of their willingness to buy. 1 - When its perceived value exceeds its price. 2 - Fairness compared to another consumer's purchase or a producer's cost. 3 - Incentives relative to the price. 4 - Reference prices such as the last known sale or purchase price. 5 - Perceived exploitation of the consumer. 1 - Actually using a previously purchased product. 2 - Understanding per line item if there are parts, what the cost is. 3 - Paying for the product close to the time of use, which enforces the product's value. Pricing can make or break a product line even if the products are great. These steps will help act as a guide, making sure the price matches not only the product, but the market.